Not sure where to start with ZO? The fundamental 5 are a carefully selected group of products recommended to rejuvenate and revitalise dull, tired skin. 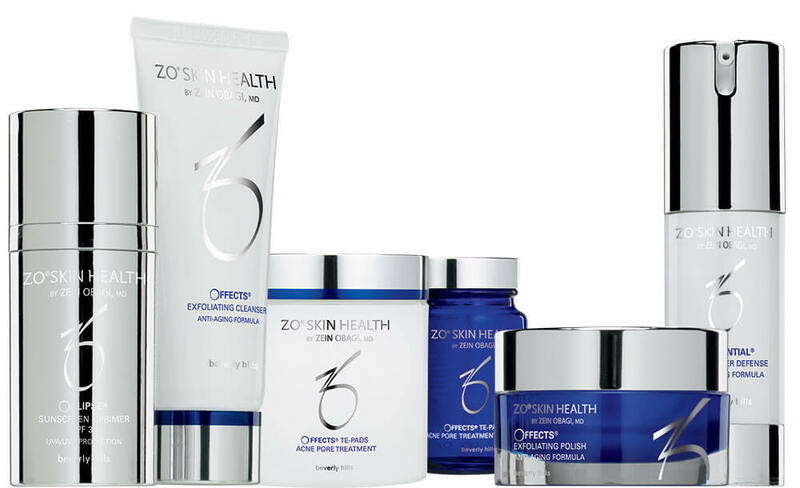 In 5 easy steps, you can start your ZO journey to younger, healthier looking skin. Wash, scrub, oil-control, stimulate and protect. This cleanser and exfoliant combination targets oil, dirt and bacteria in the skin leaving it deeply cleansed, without stripping the skin of its natural oils. This exfoliant instantly polishes skin to restore a smoother texture and deliver healthy glowing skin. A dual-chemical exfoliation removes dead skin cells to prevent clogged pores and help decrease a potential acne breakout. Formulated with retinol, enzymes and antioxidants, this skin restorer helps to stabilise skin by repairing damaged cells and protecting skin against future damage. A broad-spectrum UVA/UVB SPF that uses a multiple-defense sun protection system to provides full-spectrum defence against UV rays in addition to shielding skin from the ageing effects of HEV light (high-energy visible light). Cellulite may be a very common skin condition, but there’s also a lot of misinformation about it. Learn the true cellulite facts about what it is, what causes it, and how to get rid of it below. It’s not actually fat but rather the dimples and bumps that are seen when fat is divided into tiny pockets in the skin. Unfortunately, this one is true. Women’s skin is designed in a way that allows for dimpling and bumps to occur whereas men’s fat compartments are much small and thus spreading isn’t as common. No matter what weight you are, you can still be a victim of cellulite. Whilst body fat and exercise can definitely have an affect on cellulite, this condition can also be hereditary, caused by hormonal imbalance or even inflammation in the skin. Cardio can help keep weight off, which may reduce the appearance of cellulite but to really smooth out the skin, strength training is ideal. Building muscle and toning your body helps to truly treat cellulite. As you age, your body produces less oestrogen, meaning circulation in the body does not flow as easily. In addition collagen production slows down as well as the breakdown of older connective tissue. All these factors play a part in increasing the chances and appearance of cellulite. Exercise, exfoliation and stimulating the skin all can make a difference in smoothing out your skin. What’s more ZO’s Cellulite Control Creme is a groundbreaking new treatment that delivers an instant firming effect to visibly improve the texture and appearance of cellulite. Find out more about this product and how to treat cellulite. The Fitzpatrick Scale was the original skin classification system, developed by Thomas B. Fitzpatrick in 1975, as a way to estimate the response of different skin types ultraviolet (UV) light. The scale took into consideration the risk of burning a certain skin colour had and the chances of developing melanoma. Very Fair: Always burns, cannot tan. Fair: Usually burn, sometimes tans. Medium: Sometimes burns, usually tans. Olive: Rarely burns, always tans. Brown: Never burns, always tans. Black: Never burns, always tans. The problem with this system, however, is that it does not take into account ethnic background and the fact that the same skin type/colour can react differently due to this background. This is where Dr Obagi stepped in to develop the system to include this very crucial element of information. 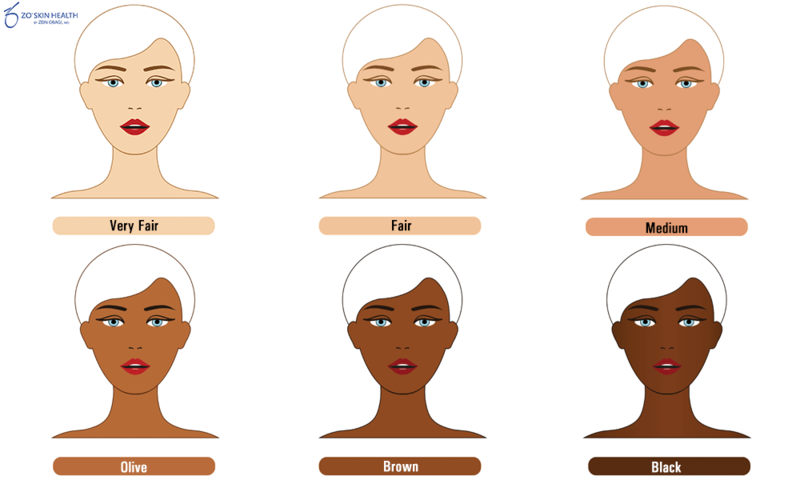 The Obagi Skin Classification system takes ethnicity into account and how your background and origin can affect the skin’s response to various treatments. Healing time, reaction intensity and ultimate outcome are all taken into consideration. Furthermore, this skin classification system gives a guide on how long and aggressively doctors should condition and prepare their client’s skin for treatment. The Obagi Skin Classification system categorises skin into three main classifications: original skin, deviated skin and complex skin. Those classed as having ‘original skin’ are not racially or ethnically mixed. This includes original light white, original dark black and original dark Asian (yellow-toned). Deviated skin are those racially or ethnically mixed. The skin of mixed ethnicity (from several different or unknown origins) can behave in an unpredictable way during treatment. Deviated skin’s appearance is either a darker white or a lighter brown. Similar to deviated skin, complex skin is those who are racially or ethnically mixed and can have a variable colour tone. For example, it can be dark in some areas but light in others. Find your nearest ZO Skin Health professional to learn your accurate skin type. Rosacea is a chronic acquired skin condition that often affects adults between 30-50 years old. It is 3 times more common in women who are fair skinned and find that they flush quite easily. Ever feel so frustrated with your skin that you just want to hide away? Well, now you don’t have to with the help of ZO®. The most common symptoms of rosacea are facial redness, telangiectasia, inflammation and swelling. It usually affects the nose, cheeks, chin and forehead areas. If left untreated, it can progress into acne rosacea, developing papules, which is why rosacea can be misdiagnosed as acne. However, it#s important not to confuse acne as rosacea, as certain acne treatments can aggravate and worsen rosacea skin. The exact cause of rosacea is still unknown, which is why only its symptoms can currently be treated and corrected. However, there are some known triggers such as a drastic change in temperature, physical exertion, sunlight, stress, alcohol, caffeine and spicy foods. Other than avoiding the most common rosacea triggers. ZO® has a ground-breaking rosacea treatment called Rozatrol™. This normalising serum treats, stabilises and prevents rosacea symptoms. But it can also just be used for red or sensitised skin. How does Rozatrol™ work to treat Rosacea? It helps to minimise inflammation with its Inflammatory Modulation Complex. The inclusion of the ingredient Palmitoyl Glycine promotes healthy microcirculation, so helping to avoid flare-ups when you physically exert yourself or increase circulation in the body. Treating rosacea requires controlling inflammation and this can be done through balancing oil production. Rozatrol™ prevents excess sebum production and provides antimicrobial benefits as well. This rosacea treatment also includes Papain which provides gentle, enzymatic exfoliation to improve skin texture and tone. Also, restores healthy cellular communication in addition to including the exclusive ZO® complex ZO-RRS2™ which provides powerful antioxidant protection and minimises inflammation. Rozatrol™ also helps to normalise rosacea by replenishing hydration and strengthening barrier function with Glycerin. Find out more about Rozatrol™ here. Discover the different types of Rosacea here. Read an in-depth report on Rosacea symptoms and its triggers. https://zo-skinhealth.co.uk/wp-content/uploads/2017/07/treating-rosacea-ft.jpg 364 705 Alex https://zo-skinhealth.co.uk/wp-content/uploads/2018/05/ZO-Skin-Health-PMS072C.png Alex2017-07-21 09:00:432018-09-28 10:09:09What helps correct Rosacea? Is Pollution Ageing Your Skin? https://zo-skinhealth.co.uk/wp-content/uploads/2017/07/pollution-ft.jpg 364 705 Alex https://zo-skinhealth.co.uk/wp-content/uploads/2018/05/ZO-Skin-Health-PMS072C.png Alex2017-07-20 00:00:452017-07-20 12:05:26Is Pollution Ageing Your Skin? We’re always talking about the exclusive bio-engineered complexes in ZO products. You’ve probably seen us mention ZOX¹²™, ZPRO™ or ZO-RRS2™ or seen at least one in a list of key ingredients. But what actually are they? These are bio-engineered complexes, exclusive to ZO®. Each one is a powerful formulation designed to enhance and improve the skin. This is an exclusive antioxidant complex, encapsulated with vitamins A, C, and E. It a has a 12 hour time release and is designed to protect the skin from free radical damage and shields the skin from harmful IR-A (infrared) rays. ZOX¹²™ works to inhibit future signs of premature ageing. The ZPRO™ is an exclusive antioxidant and biomimetic protein complex. It includes the ingredients Hydrolyzed Sericin and Buddleja Davidii Meristem Stem Cell. What this complex does is enhance the production of collagen and hyaluronic acid as well as protecting the skin against cellular damage and collagen degradation to keep skin healthier and younger for longer. 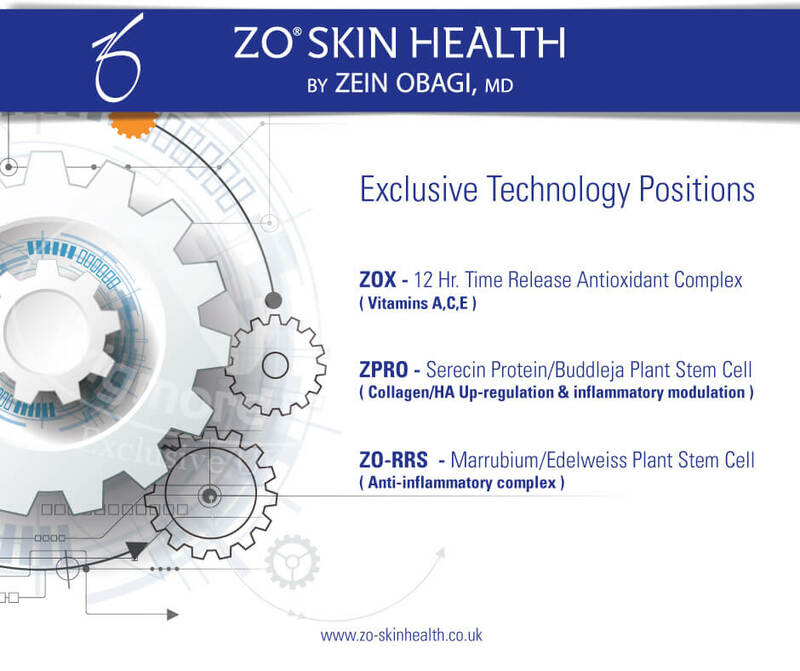 ZO-RRS2™ is an exclusive plant stem cell complex. Formulated with Marrubium Vulgare Meristem Stem Cell and Leontopodium Alpinum Meristem Stem Cell to provide powerful antioxidant protection. In addition minimising skin inflammation to prevent future skin damage. How many Rosacea types are there? Rosacea is a tough condition to deal with, it’s even tougher if you don’t know you have it. It can vary substantially from one person to another which often leads to misdiagnosis, mistreatment and frustration. There are actually 4 different types of rosacea, and each subtype has a different set of symptoms. Some types of rosacea are more common than others but it’s important to be aware of all of them so you can spot the signs before the condition gets severe. Many people experience more than one subtype of rosacea at the same time. These symptoms often emerge in succession to one another and each individual rosacea trait can develop in severity. This is why early diagnosis and treatment is ideal, to tackle and reverse the symptoms before they become extremely severe. Flushing and persistent facial redness are probably the most common rosacea type. Within this subtype, small blood vessels may also become visible and in more severe case, stinging, burning, swelling and roughness or scaling may occur. This is the subtype which is often misdiagnosed and mistreated as acne. Your skin may experience acne-like symptoms such as redness, papules and pustules. However, it should not be treated as acne, as acne treatments can worsen your rosacea. 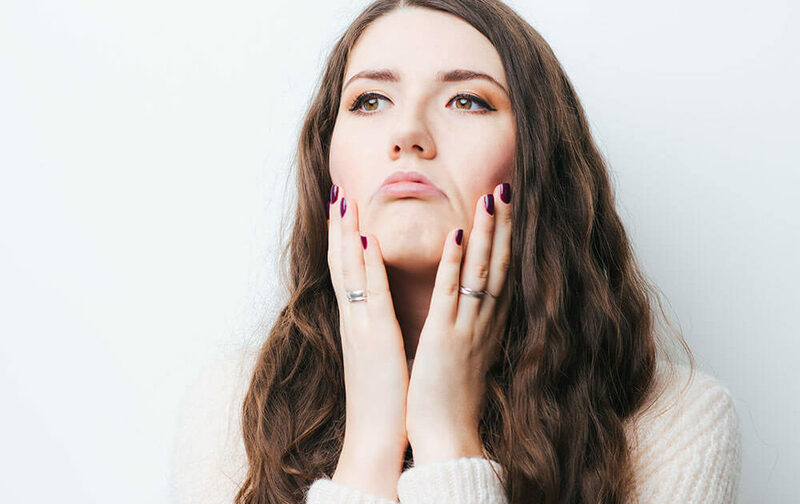 The best way to distinguish between acne rosacea and acne vulgaris is that rosacea sufferers experience persistent redness and flushing, while you’ll only find comedones in acne skin. This is a rarer subtype of rosacea which tends to affect men. You may experience an enlargement of the nose, where excess tissue and a thickening of the skin occurs. This giving the nose a bulbous appearance. Many are unaware that rosacea can actually affect your eyes. It can cause a watery or bloodshot appearance as well experiencing irritation, burning or stinging. The eyelids can also become swollen, and styes are common as well. ZO® Medical is has created the one-step solution to treating rosacea symptoms. Rozatrol™ is the breakthrough treatment from Dr Obagi that works to reverse, treat and soothe the signs and symptoms of rosacea skin. To get you feeling your best self again! Find out more about this incredible innovation here. https://zo-skinhealth.co.uk/wp-content/uploads/2017/07/types-of-rosacea-ft.jpg 364 705 Alex https://zo-skinhealth.co.uk/wp-content/uploads/2018/05/ZO-Skin-Health-PMS072C.png Alex2017-07-14 16:05:002018-09-28 10:18:13How many Rosacea types are there? Skin cancer is becoming more and more common, but catching it early can greatly increase its treatability. So it’s important to be familiar with your body and regularly check your skin for any cancerous moles. 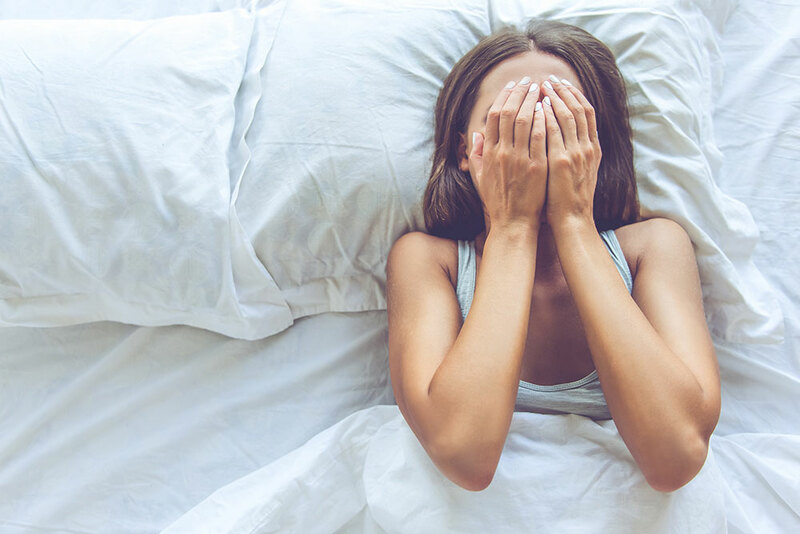 Below we talk about what you should expect from a normal, benign mole and what signs should be alarm bells for something more dangerous. Moles are small, often brownish coloured, spots on the skin that are made up of cells called melanocytes. Melanocytes produce the pigment in the skin which causes you to tan. Though moles are commonly brown, some may be darker or even skin-coloured. A normal mole can be flat or raised, smooth or rough, and some have hair growing from them. They are usually a circular or oval shape with a smooth circumference. In your teenage years, they can increase in number. During pregnancy, they may get slightly darker. As you age, reaching 40 to 50 and onwards, moles may begin to disappear. While most moles are completely harmless, you should check your skin every few months for any new moles that develop or for any change in existing moles. This is increasingly important after your teenage years when new moles are less common. Most are often benign, but some can develop into melanoma, which is a serious and aggressive type of skin cancer. 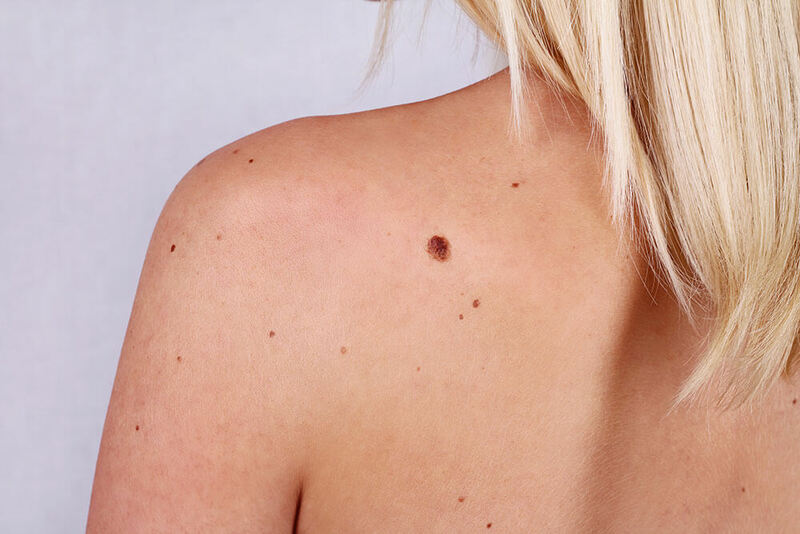 Melanomas (cancerous moles) usually appear as a new dark, fast-growing spot where there was not one before or an existing mole changes in size, shape or colour and bleeds, itches or reddens. There are certain changes that occur in a mole which can indicate that it has become melanoma. If you see any of these symptoms, visit your GP immediately. There is an uneven colouring. (Most moles only have one or two colours, but cancerous moles have lots of different shades). Your mole(s) have an uneven or jagged edge. It has begun to bleed, itch, become red, inflamed (swollen) or crusty. To significantly reduce your chance of developing melanoma, it’s important to take extra care in the sun, especially if you have lots of moles. Avoid UV exposure where possible. Stay in the shade when the sun is at its strongest (between 11 am and 3 pm). Cover up with long sleeved clothes, a wide-brimmed hat and sunglasses. Avoid using sunbeds because they emit harmful UV rays. Use a high-factor sunscreen (minimum SPF15) and reapply it regularly, particularly after swimming or perspiring. Make sure your sunscreen has broad-spectrum UV protection and does not just say SPF on it. ZO sunscreen’s all include broad-spectrum UV protection. Dr Obagi has also formulated a brand new triple spectrum of sun protection, going beyond superficial protection to really give you the safest sunscreen on the market. Find out more about ZO’s Triple-Spectrum sun protection here. Need help choosing the right suncare for you? Click here. An agent in skincare is an ingredient that takes an active role in improving the health of your skin. Whether it’s evening skin tone and texture or boosting collagen production, topical agents help to get your skin functioning again. However, not all ingredients work the same, there are certain topical agents which are essential whilst others are more suitable as support, optimising the benefits of those essential agents. What Are The Principal Goals For Skin Restoration? To strengthen the skin’s barrier function to prevent future damage. Promote epidermal renewal for glowing skin. Prevent skin from acquiring avoidable sensitivity. Decrease chronic inflammation and redness. Repair DNA damage and protect from future harm. Regulate melanocyte activity, to prevent hyperpigmentation conditions. What Are Essential Topical Agents for Skin Restoration and Why? Vitamin A (applied as Tretinoin and/or Retinol) is a potent topical agent that works to improve skin functions in both the dermis and epidermis to deliver stronger, healthier skin. Hydroquinone restores epidermal barrier function and enhances exfoliation for glowing skin. Antioxidants stimulate fibroblast (a cell in connective tissue which produces collagen and other fibres) activity, as well as optimising hydration in the skin through GAG production such as Hyaluronic Acid. DNA Repair Agents stabilise melanin production and ensure even distribution of melanin to prevent brown spots, hyperpigmentation, melasma and similar pigmentation conditions. Anti-Inflammatory Agents minimise chronic inflammation in the skin, soothing and calming skin as well as protecting the skin from free radical damage. Growth Factors repair DNA damage and help protect it from future harm. What are Supportive Agents for Skin Rejuvenation? Alpha Hydroxy Acids (AHAs) like Glycolic Acid, Lactic Acid and Mandelic Acid, are mildly therapeutic and should be used in conjunction with your essential agents for optimal skin recovery. Beta-Hydroxy Acids (BHAs) such as Salicylic Acid restore epidermal barrier function and enhance exfoliation to promote cell turnover and radiant skin. Non-Hydroquinone Pigment-Stabilising Agents such as Kojic Acid, Azelaic Acid, Arbutin and Resorcinol are ingredients which are excellent for balancing melanin production. If you prefer to use Non-Hydroquinone products, these topical ingredients are the ones to look out for in your skin care. Find your nearest ZO Skin Health professional to start your skin restoration journey here. We have previously talked about how dry skin is not the same as dehydrated skin. Dehydrated skin can be attributed to a bad diet, not drinking enough water and using moisturisers. Yes, you read that right, moisturisers are a detriment to your skin. The skin has its own hydrating abilities, but moisturisers can become a crutch to your skin, reducing the water gradient and feedback mechanism in the skin that enables it to hydrate itself. Find out more about why moisturisers are bad for the skin here. While dehydrated skin often feels tight and parched. Dry skin or Xerosis can be extremely uncomfortable and even painful, with skin becoming scaly, itchy, cracked or inflamed. Those with dry skin often also tend to experience skin problems such as eczema or psoriasis. over cleansing or over scrubbing the skin. taking steaming hot baths or showers. showering or bathing more than once a day. living in areas with cold, dry winters. Environmental factors such as excessive sun exposure and pollutants in the air can damage the skin. Dry skin is often a problem in the winter because heating systems are used regularly, and steaming hot showers are common practice. This un-humidified or scorching heat, strips moisture from the skin causing it to become severely dry. Plus, in the winter or in cooler climates, the body protects itself from the cold winter air by drawing blood away from the skin. This resulting in a lack of nourishment for the skin and consequent Xerosis. Emollients are your answer to dry skin. Emollients are moisturising treatments applied directly to the skin to reduce water loss and cover it with a protective film. The protective film prevents water from evaporating from the skin’s surface to keep moisture in the skin. Additionally, it helps smooth over scaly skin and soothes irritated skin conditions such as eczema. Apply it all over after showering or in any areas that need specific treatment. Find your nearest ZO Skin Health Professional here for product recommendations.